Since I am on a roll about honesty, I thought I would share another confession with you. Yes, it is another one of those things you just don’t hear much about in homeschool circles and it often can make our family feel a bit out of place. I have a reluctant reader. Boy, confession really does feel good for the soul. It is not that my daughter doesn’t love stories, (she LOVES audio books)she just gets very intimidated by the size of a book, and to be honest with her quick attention span she is ready to move on to something else before finishing one. This is one(of a couple) thing about educating with Waldorf , and not exposing children to any preformed images,that has always made me feel very guilty. However this year I have “let go” of how other people think I should educate my children and started to focus more on HOW my children NEED to be educated. I have learned that my 10 year-old daughter is very right-brained and a VERY visual person (this is why most of Waldorf education has worked for her). This is also why she can watch a documentary on Annie Oakley in second grade and 2 years later remember everything she learned. I have also come to realize her brain sees everything in 3-D and does better with pages filled with color rather than black and white( why she has doodles all over her Kumon workbook pages). So it would only make sense she would rather read pages full of color. So with Miss Sky almost finishing The Hobbit(in 2 days), what else have we been doing this week? And is coming right along with her typing, which she much rather do than write. And last but not least there has been lots of planning going on for our Urban homestead. I seem to have found myself without much time for the computer lately, which in my opinion is a good thing. This past week my mind has been much clearer and my mood, well has been great!! I have often wondered if the internet had anything to do with aiding depression and mood swings. After being internet free for 1 week I believe more and more that it does. Not one time did my children irritate me, and no they did not act any differently then normal. In fact if anything I found out a lot of the reason for their misbehavior is because the screen has the majority of my attention instead of them. So my blog may look a little different as I pledge to myself to keep posts under 30 minutes. and played in the rain. Well I did it ! Wishing everyone a great weekend ! Well here we are, another Friday has arrived and I am left feeling like I have not accomplished anything. I start the week out with great plans but fall short in the execution department. I could start listing a bunch of excuses like blaming it on the weather but really the fault is all mine. You see I have developed a problem that only I can change. Like most problems it didn’t start out this way, in fact, I always start out with the best intentions but something, what my family likes to call The Beast, grabs me away. This problem is something that you never seem to hear much about but I can attest that it does indeed exist. I can also assure you that admitting it is not an easy task. I have IAD, there I said it. There is a wonderful book out, I am sure many of you already know about, entitled Simplicity Parenting as I am leisurely reading through, something all of a sudden clicks with me. So many of us are working to simplify childhood but what about simplifying ourselves? After all, children learn through imitation. Yes, we go through and declutter our homes of possessions, I clear out half of my children’s toys and books why, because having too much is overwhelming to them right? Boredom is a good thing, right? Yet we are exposed to something on a daily basis that contains more information then we could ever digest in a lifetime (Why to wait for God’s reply I’ll just google it). So this next week starting Sunday until Saturday I am going to do something that, for me, is very hard. I am going to simplify my brain and pull the plug on our internet. This means no e-mail, blogs, or youtube for 1 week. If I need to talk to someone I will call them or maybe even write a letter. My children are home with me everyday yet I feel like I am never with them. I don’t want my children to remember me by always having my face glued to a screen. I want them to remember my smile and warm embrace. I will see you all next Saturday and maybe just maybe I will have accomplished all I set out to do for once :). Many Blessings friends for a great weekend! What a scorcher today was, the grill recipes and sprinkler have been officially brought out. It amazes me how on Monday we were still eating soup and 2 days later we are out in the sprinkler(crazy). Anyway, you can imagine the distraction the heat caused for Miss Sky. So school has been very minimum. 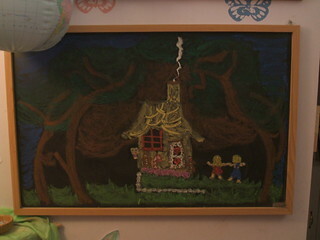 Yesterday Little Sis acted the story of Hansel and Gretel out. This was so cute I love hearing what parts of the story the girls take to the most. When retelling a story, I never “quiz” the girls. If they forget parts I don’t remind them. I just take it that it must not be very important to them. Next Little Sis made her picture. Meanwhile, Miss Sky practiced her spelling words by first looking at them, then turning her paper over and writing them from memory. She also looked her vocabulary words up in the dictionary and copied the definition. Today she worked on level 2 of Roller Typing then typed her spelling words twice. 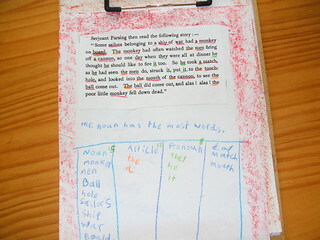 I printed off the story from Grammar-land for Mr. Adjective and Miss Sky read the story and underlined all the adjectives. 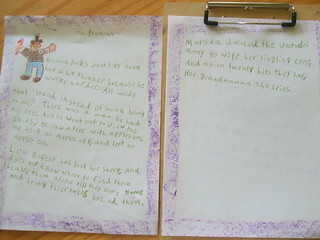 I also assigned Miss Sky to write her own fairytale. She decided to write about a family of dragons. 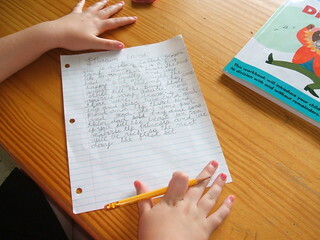 She wrote, in cursive, front and back and titled it Dragon Land. 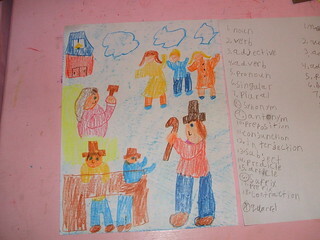 Again this was a creative writing project and was not “corrected” in any way. She has a wonderful imagination and loves to make up stories all the time. For reading, I read chapter 1 of Ramona The Pest by Beverly Cleary. Little Sis is loving this series and is asking me to reread certain chapters from Beezus and Ramona. Finding books to read that will entertain both girls can be hard. I am finding out just how opposite the 2 girls really are the more they grow. Miss Sky LOVES animal stories and Little Sis is all about girly stories. So I can honestly say all of us have been enjoying our read-aloud time together :). I hope everyone had a very happy mother’s day! It was just the calm my spirit needed. Today though it was business as usual and for Little Sis, this means a new story. She has a tendency to speed through everything. You give her a workbook and she could easily finish the whole thing in an hour. I am hoping working with a three-day rhythm might slow her down a bit. 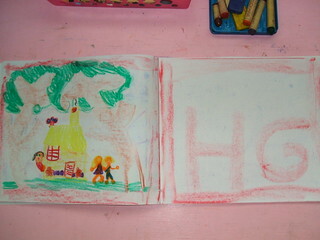 So today I read the story of Hansel and Gretel by the Brothers Grimm. I am using this story as part of Miss Sky’s lessons as well. 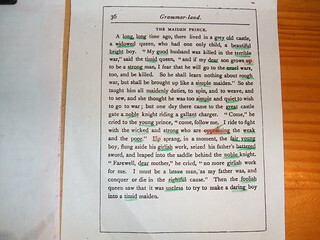 Besides Grammar-land we will be talking about fairy tales and who exactly those Grimm brothers were. First, though it was math Monday. Today I made some problems for Miss Sky to practice using carrying and borrowing while Little Sis practiced writing her numbers 1-20. Then we started to circle, using the same fingerplays and songs from last week. After reading our story I gave Miss Sky her spelling words to copy. 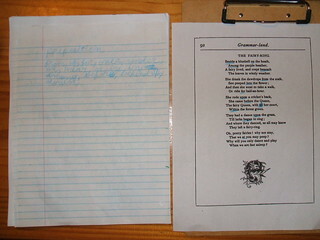 After she was done we listened to the next chapter of Grammar-land and being that it reviewed noun, article, and the pronoun I printed off the exercise for Miss Sky to do before moving on. Then we listened to the chapter about Mr. Adjective. 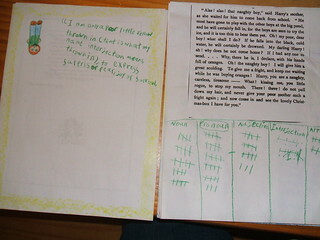 For Reading today Little Sis read books 16 & 17 of I See Sam. She is doing much better sounding out the will and with. Miss Sky is reading Happy Birthday Kit independently, and I finished Beezus and Ramona. Well to wrap up our week, Wednesday we listened to the chapter about Pronoun. “He is just like noun only thinner and looks as if he worked harder.” I printed the poem at the end of the chapter for Miss Sky to change the nouns into pronouns then on Thursday she copied it in her MLB. We will continue more with Grammar-land next week. So for Little Sis, we will continue with more Grimm’s Fairy Tales by reading the story of Hansel and Gretel (to prepare for the letter H as well). I can still remember how much this story affected Miss Sky. We read it every night for about a month, almost like Little Sis and The Three Bears. I will be using this story for Miss Sky’s grammar lesson too. 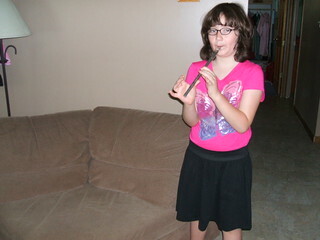 I am actually excited to be planning next weeks lessons around Little Sis for once. I feel like she has missed out on quite a lot of my focus always on Miss Sky’s lessons. So hopefully there will be some painting, beeswax, and a little science thrown in as well. 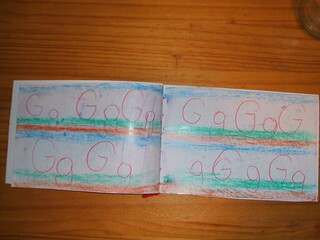 Little Sis did finish her G letter book. 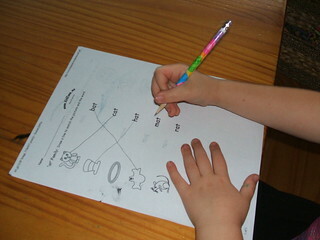 We went over Miss Sky’s spelling words yesterday and since she had them all down there was no need to be tested today. She also finished her book Kit’s surprise. So today we finished the week with a little baking :). There was no way I was getting out of the letter G without making The Little’s most favorite cookies, and of course, there was a telling of The Gingerbread man too. Only guess what Little Sis has moved on from this story. 😦 “The Gingerbread Man is for babies mom”, no, no this can’t be. Oh well, at least one thing still remains the same. Wishing everyone a great weekend! I thought with Simple Homeschool having a curriculum fair, I would post about our plans for next year. I have definitely made some changes, for one we will go year round and take off whenever we need to. I have always felt stressed trying to squeeze 180 days of school in between September and June. If Miss Sky wanted to linger a bit on a topic or if someone had an illness I felt rushed to move on. I mean who made the rule that school and life had to be separate, this is our life right? Don’t get me wrong though we are not going year-round to get 2 grades done a year, it’s more like I now have 365 days to get 1 school year in. One thing about Waldorf education I never liked was the fact that American history doesn’t come in until 8 grade. The reason behind this is because Steiner believed our education approach should mirror our evolution as human beings. Learning history from the very beginning does make sense but I believe culture plays a huge part in who we are and we are Americans. Then there is Little Sis starting her school journey. Combining this year has really worked well for us. So I have decided For Miss Sky’s 5th grade and Little Sis’s first grade we are going to read through the Magic Treehouse Series by Mary Pope Osborne as an introduction into world history(using the library to add to each topic). There is also a great website filled with ideas (look under teaches at the top of the page).Then for topics that are covered during 5th grade in a Waldorf school, like ancient civilizations, we will dive in and stay awhile. We will study botany from each continent as we go. For Little Sis, I am adding the book Around The World in 80 Tales by Saviour Pirotta. As Jack and Annie travel around the world so will we and finish in Hawaii with a states geography block. *(Updated to add )* We also will be using Mr. Donn’s free history lessons for ideas too. Lots of great information there! I had already shifted the majority of this series just needs to add a few more and the resource guides. I found the rest used at Better World Books (Oh yeah, I love that place). For math, I will continue with Family Math by Jean Stenmark and grade-appropriate workbooks using Kahn Academy as a tutor when needed. We will officially start after we finish our alphabet study( I am thinking January 2012). 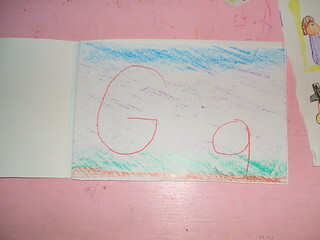 Speaking of the alphabet to catch up with school, Little Sis has continued adding pictures in her letter G book. 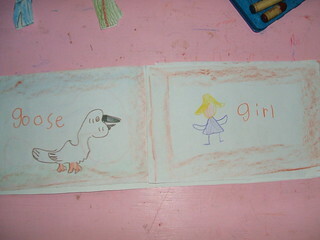 The Golden Goose and had her listen and copy 20 nouns from the story to add to her noun picture. Yesterday we listened to the tale of the poor little article and Miss Sky made a page for her grammar MLB. 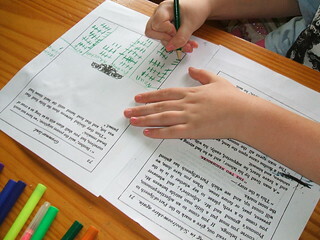 So far we are really enjoying Grammar-land, I have to say it is much more fun than doing boring workbooks. For spelling, Miss Sky practiced her spelling words by looking at them first, turning her paper over and trying to spell them from memory. Then we did something a bit different. The reason I liked spelling city.com was so she could get keyboarding skills but I really don’t like the girls to play online. Instead, I purchased the software Roller Typing for her to practice how to type and she used word doc to type her spelling words twice. She is doing really well with this software and getting good at using both hands to type. Little Sis is still using jumpstart Kindergarten, because “it’s not fair sissy gets to play on the computer”. I had her take the placement test and moved her up to level 3 because the game was much too easy for her, but she likes it. She knows how to put the disk in and pull the game up all by herself, it’s amazing. Miss Sky looked her vocabulary words up in the dictionary and copied their definition. For reading Little Sis is staying with Book 17 of the I See Sam books and I read up to chapter 5 of Beezuz and Romona. P.S. Yesterday I learned how to make hamburger buns, Yippee! Did anyone happen to catch Diane Sawyer’s Special on made in the USA? All I can say is duh. Okay what I should say is it’s about time :). John Ratzenberger you made my whole day! Well, we are attempting to continue with our letter study this week. 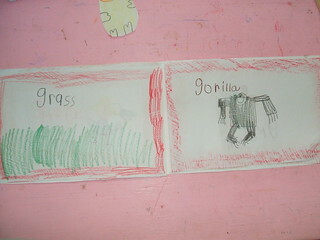 Since Miss Sky independently did a report on gorillas already I thought we would finally do our Grammar-land study. I have posted that you could find it free at LibriVox on an audiobook here, but you can also find it in pdf for free here. There is also a beautiful Waldorf blog loaded with ideas here. Something new that I am going to start trying is math Mondays. Besides fractions and geometry, math this year has not been fun with Miss Sky. 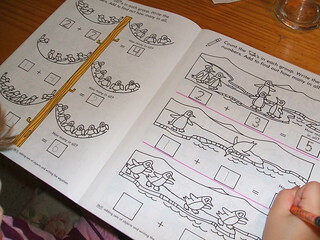 I posted how I purchased a 4th-grade math workbook and we were slowly working our way through when we had our blow up. So I thought I would give her a break and instead of doing math daily she could work on some problems or we would play games on Mondays only. As long as it is just a review of what she already knows. I will only introduce new subjects during our math blocks. Today we played multiplication war setting the timer for 20 minutes. Then I played regular war with Little Sis. So far so good, we will see how this works. I have noticed Little Sis’s growing interest in fairy tales. Books like Curious George are no longer holding her attention. So I will be adding more fairy tales into our lessons. 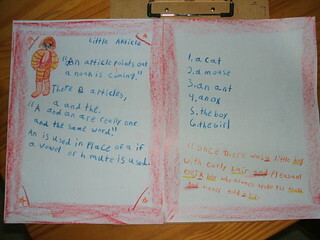 For the letter G, I have added these stories to her book basket. 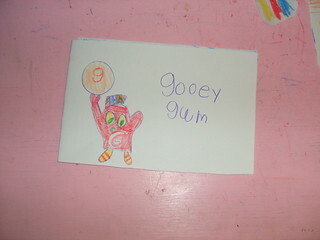 Next, it was main lesson time introducing Mr. G and his gooey gum. 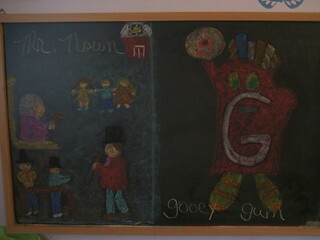 Little Sis traced the letter in the air, then on her chalkboard. 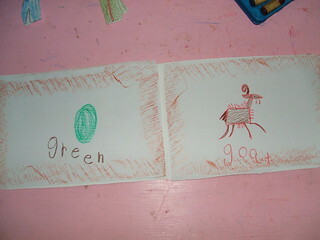 We talked how little g digs his tail into the earth below and she copied it into her Letter G book. Then we listened to the introduction and chapter 1 of Grammar-land. We will be working with a 2-day rhythm for this story since (1) it is mostly a review and (2) it has 17 chapters. So this means Miss Sky drew her picture today. We marched them out and broke the words down finding the hidden smaller words and she printed them once then once in cursive. 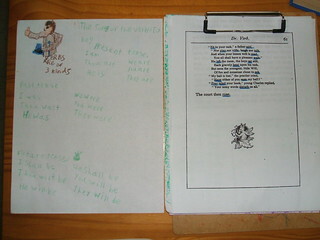 For Reading Little Sis read book 17 of the I See Sam books, introducing the words will, we, with. Miss Sky read Goldilocks and The Three Bears a loud to Little Sis and is reading Kit’s Surprise independently. I read chapter 2 of Beezus and Romona by Beverly Cleary. This series is a favorite in our home as I have 2 girls the exact age difference. Oh, how Miss Sky can relate to Beezus and I see so much of her in Beezuz as well (Nobody says I’m cute anymore). Good fun stuff indeed :).